Courtney Greer wanted to be part of the computer revolution. 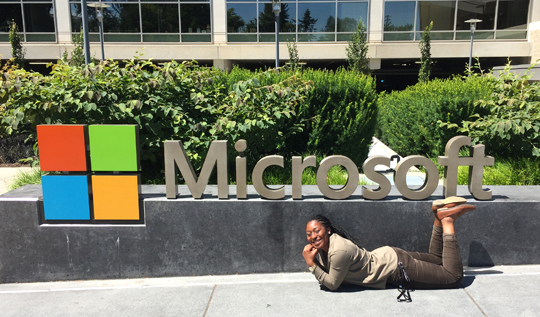 2017 UT graduate Courtney Greer has a lot to smile about; she started working at Microsoft in Chicago in July. Greer graduated from The University of Toledo with a bachelor of science degree in computer science and engineering with a minor in business administration in May. Shortly after graduation, she accepted a job offer from Microsoft, the sixth largest information technology company in the world by revenue. Once she began her studies at UT, Greer became involved with several student organizations, sports and jobs. She said her four engineering co-ops, three of which are required by the College of Engineering before graduation, especially prepared her for her future working with tech. “I did two [co-ops] with Lubrizol in Cleveland and two in San Francisco with Visa,” Greer said. “My internships helped me narrow down exactly what I was interested in my field and helped me network with people from all over. 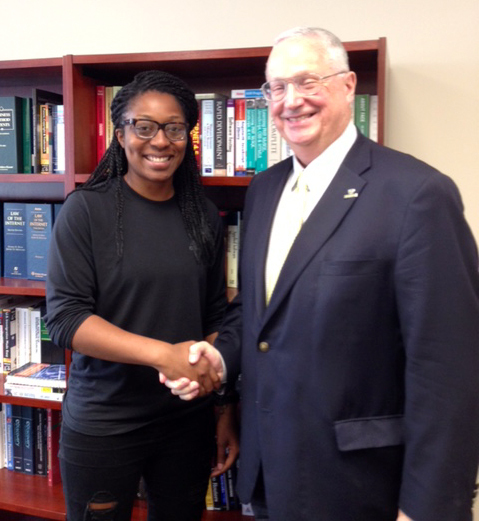 Courtney Greer is congratulated by Bill McCreary, UT vice president and chief information and technology officer, for landing a job at Microsoft. Greer seems to have found her groove at Microsoft in Chicago, where she is a partner development manager, working with a team called One Commercial Partner. “I quickly came to realize that an average day doesn’t exist in my role,” Greer explained. “My team is responsible for creating the growth of Microsoft’s cloud, Azure, in market. My sole responsibility is recruitment. I work within a team of about 20 individuals in different regions and areas of expertise to bring startups, small to medium businesses, and consumers to the cloud. She helps contact more than 300 accounts in the Midwest region. These accounts vary from manufacturing, financial services, health care and more. “I need to understand what their company produces and their mission, but also try my best to predict the business and technology needs of each business I interact with. This is why I say no day is average,” Greer said. “Any day I could be talking to a CEO and CTO of a million-dollar manufacturing company or four college students hoping to create an app that helps hospitals manage patient data. I could be working from home, or I could be working downtown and showing clients one of the Microsoft Technology Centers. I could be traveling to Vegas to a conference to speak to up-and-coming startups about the capabilities of Azure. Greer is also passionate about encouraging young women and other minorities to pursue their interests in engineering. According to the Congressional Joint Economic Committee, only 14 percent of engineers are women. “Don’t let failures stop you,” Greer advised. “I’ve read a lot of studies about how insecurities in minorities and women tend to be their downfall. They believe they have to be the best when surrounded by the majority either in school, work or in social interactions ‘or else they’ll think we’re all dumb,’ ‘or else they’ll think I don’t belong.’ It’s called the stereotype threat, and it can be very hurtful to both women and minorities in their studies. This entry was posted on Monday, November 20th, 2017 at 3:50 am and is filed under Alumni, Engineering, Features, UToday .